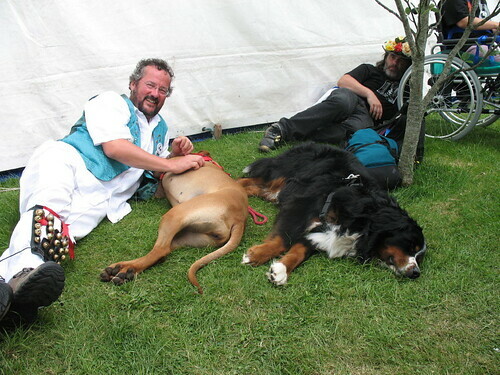 Michael Jecks: Photo Diary » Blog Archive » Injured Morrisman with dogs. Injured Morrisman with dogs., originally uploaded by michael_jecks. Well, I was very happy to finish the ride on Sunday. The more observant among my readers may have noticed that after a quick mention of falling off my bike a month or so ago, I have remained curiously silent on the subject of the London to Brighton bike ride. There was a jolly good reason for it. The Ridgeback. You see, a Ridgie whoâ€™s been stuck in a cage for three months solid (this was essential so that her spine could recover from an attack of Discospondylitis) is easily excited. Let her loose on a patch of bare grassland, and sheâ€™ll run about happily, torturing a Bernese, gaily knocking children over, and generally bowling about rather like a steel wrecking ball. And disobeying every command, of course. Especially the dull one that asked her to come to me. So when I wanted her to come, I thought Iâ€™d had an inspiration when I remembered an old trick. Puppies think that they may be abandoned, you see, if you turn and walk away from them. So I called her, turned my back, and next thing I knew was, it had worked! Yes, she came as soon as she saw me walk off. And she ran through me, throwing me to the ground in not inconsiderable discomfort, bearing in mind all my weight had fallen on my right ankle, twisting it severely. Well, it swelled up like a balloon, reaching about double its normal size a day later. And with three weeks to go to the ride, I couldnâ€™t practise at all. This was a deeply alarming disaster. The main problem was, Iâ€™d already garnered some Â£1,000 and couldnâ€™t just back out. Whoâ€™d refund all that cash? No, I had to go ahead with it, no matter what. So I bought some support socks, Shelagh Palmer (THANK YOU) made me some aromatherapy jollop, and I worked hard at sitting still with my leg in the air. All in the interests of good health, you understand. Which is one reason why you may have noticed there were no photos of me at the Royal Cornwall Show with Tinnersâ€™ Morris. Sadly, I just couldnâ€™t do a darned thing there. I tried to hop on my leg, but it was too weak and hurt like hell when I tried, so I opted for the ale-drinkerâ€™s cure, and watched the others with great jealousy while I sat on the sidelines and took photos of them all. This entry was posted on Tuesday, June 19th, 2007 at 3:06 pm	and is filed under Bike ride, Dartmoor. You can follow any responses to this entry through the RSS 2.0 feed. You can skip to the end and leave a response. Pinging is currently not allowed.